Entering rides at this time of year is always a bit of a gamble, but the weather was pretty much perfect; reasonably mild, dry, still. The route was also ideal for those of us who hadn’t been near a bike for about 3 weeks, being kindly flat. The start time was 10 am which is fairly late for an audax, the idea being that if it was frosty/icy the sun might have melted it by then. After a leisurely coffee in Leeds station I got on the almost empty train, which then sat at the platform for an extra 15 minutes because of some overhead line problems. Although I had a little time in hand I had intentionally not left too early, knowing there would be no warm village hall to wait around in. 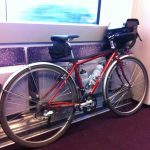 I started to think about getting some cash out at York station for a statement to show my start time if the start had closed by the time I got there, or thinking that since I had the route sheet I could always just ride it and not worry about the brevet card and validation…but in the end it wasn’t a problem. 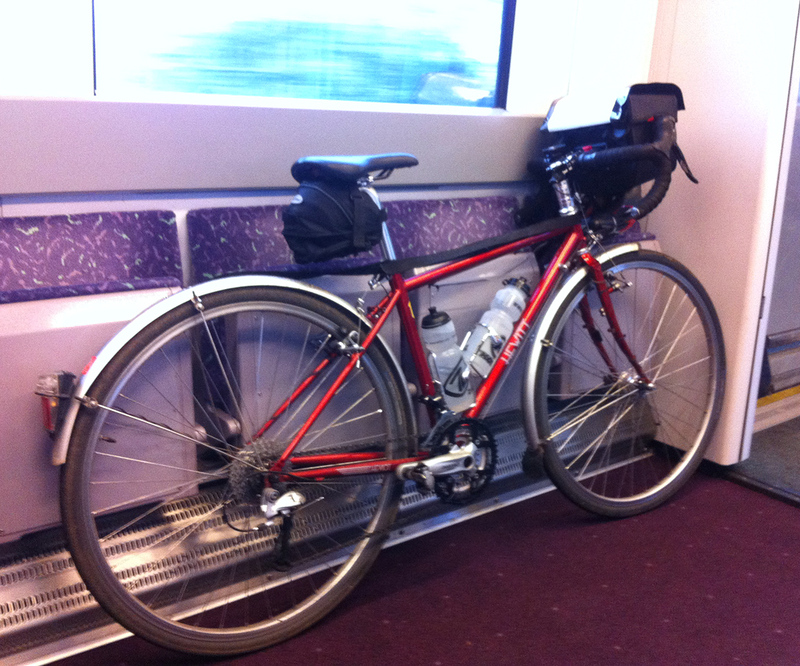 The ride was originally to start and finish at York train station (more like this please!) but the numbers expected at the start dictated a move a mile or so along the road, with the organiser’s car boot serving as an office. Eventually leaving the train station at 10 am I followed the instructions to Knavesmire road, missed the turning (according to the route sheet the was a kebab sign which I didn’t see) but quickly realised that the 20 or so cyclists crowded around a car probably marked the depart, so a quick u-turn got me back on track. Once registered I set off across the racecourse as instructed. Not 100% convinced I was going the right way I was relieved when some other riders caught me up. We followed the river Ouse for a while although it couldn’t often be seen. Some great pace names around here, Acaster Malbis was a favourite. 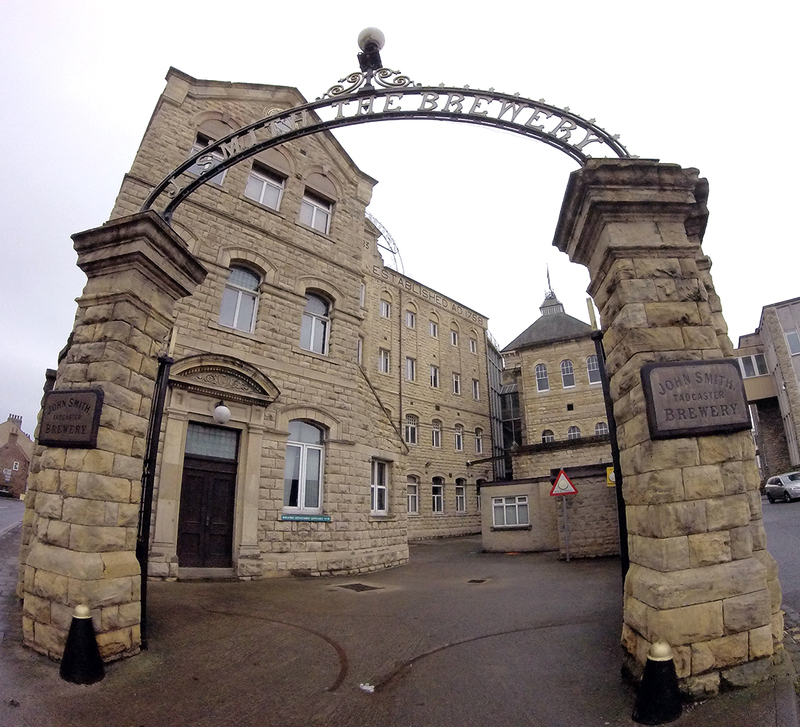 Then west to the Wharfe and the first visit to Tadcaster before skirting the Thorpe Arch industrial estate. This was the only section of the route that I recognised, having visited a friend who works here a couple of months ago. I always like having little familiar sections as it helps the geography connect in my mind; when I visited my friend I took the bus and remember thinking the roads looked like they’d make a nice bike ride. Approaching the first control at Boston Spa I could feel myself struggling, and coming up the small hill to the main street it was bonk time. Before the christmas lull I had been (mainly) avoiding carbs and although I’d eaten some on rides I had managed pretty well without emergency coke etc. The holiday diet had clearly allowed my body to get back into the blood sugar swinging habit though, so I did the only thing I could and got a bottle of cherry coke and a packet of salt and vinegar crisps for my receipt at the free control. Then I also ate the section of tortilla (i.e. Spanish omelette) that I had brought with me as a low-carb option. The coke did its thing reasonably quickly, but I know that once you start with the sugar you have to keep going. I had pencilled in some vague times to work to, based on a riding speed of 21 kph, and I think I was about 15 minutes behind, which wasn’t bad as I’d effectively started a bit late. My pace might not have suffered during the cycling break but my neck, hands and most of all backside were certainly out of practice. My hands/arms were not helped as I’d spent the previous day hacking at the garden. I have at least developed good habits of moving fingers and toes periodically throughout rides to prevent pins and needles, and coming off the saddle and moving about to stretch back and neck. Must get back to pilates though. 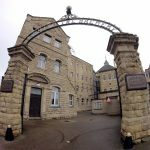 Back through Tadcaster (now the West Riding part, the north-east of the town as passed through on the first stage is in the Ainsty of York, according to the definitive source of knowledge) and its brewing heritage became clear passing the Tower (Corrs) and John Smith’s breweries. A short stretch of A road out of Tadcaster brought us to the B1223 which would be followed for the next 20 km, through Ulleskelf (a native Yorkshire-person required for pronunciation) and along Boggart Lane for some more great names. 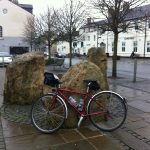 The next control was Selby, a garage was suggested but all that was required was a receipt, and seeing many cyclists in the forecourt and not really fancying a limp sterile sandwich I continued into the town centre. Everything was closed apart from a couple of pubs, but I had glimpsed a ‘retail park’ sign and found a Sainsbury’s, unfortunately without a cafe but with toilets and slightly more lively sandwiches. The route sheet instructions for leaving Selby were not very helpful, and having stopped where no other audaxers were I had no reassuring sight of others, but it soon started to look right. After negotiating the crossing of an A road (actually fine, probably the large number of cones around roadworks helped in slowing people down) the route followed the B1228 more or less to the outskirts of York. Looking at the map this was nothing out of the ordinary, but riding it felt like a very long, featureless stretch. 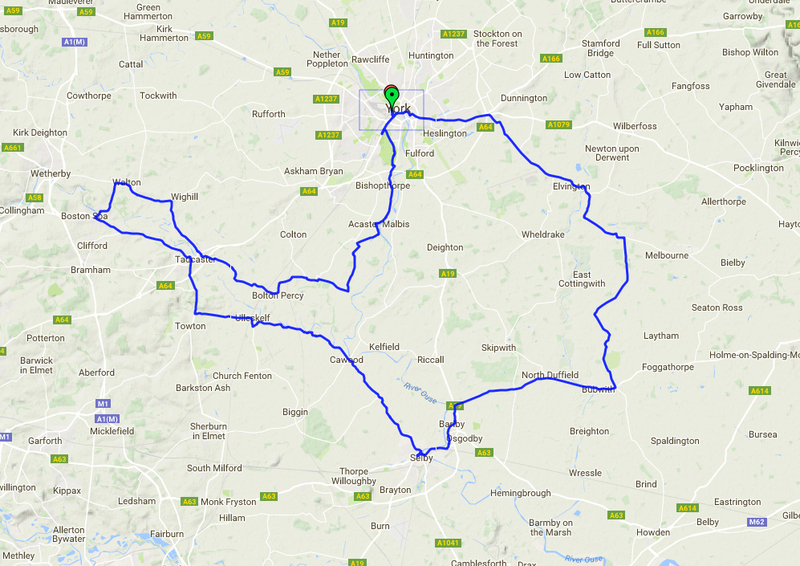 I tend to find that concentrating on the route sheet/map occupies my mind and so when there are no instructions required, no junctions, and in this case no features, the ride becomes rather monotonous. I was uncomfortable too, mainly on the saddle, which didn’t help. Coming up to a big roundabout junction with the A64 a few of us bunched together, the rest scraping through an amber light while I was glad of the rest for the next green, only to pass some of them as a GPS had tried to send them down a slip road to the dual carriageway. We rode together from here on to the finish, the route sheet sort of gave up at this point so I was following road signs for the city centre, figuring (wrongly) that the train station would be well signed. 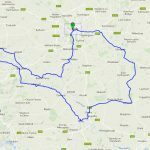 The others mistook me for someone who knew where I was going, although now I look at the route as recorded by Strava it wasn’t quite the circuit of York that it felt like at the time, and my timing was still 15 mins off planned so nothing lost. Happily one of the company got to a point that he recognised and gave us directions to the arrivee – he wasn’t bothered about validation as he had a dog waiting at home. Once we got to the station my core skills proved invaluable and I was able to direct the others to the correct pub where the organisers were waiting. Although a pint was inviting I knew that I still had to get home so settled for a coffee and a bit of cycling chat/flirtation with William in Starbucks, then the next train to Leeds. Another rider was on it, going home to Huddersfield. The ride uphill in Leeds was a struggle, a combination of saddle-soreness, zero energy and slight nausea as I regretted the coffee. 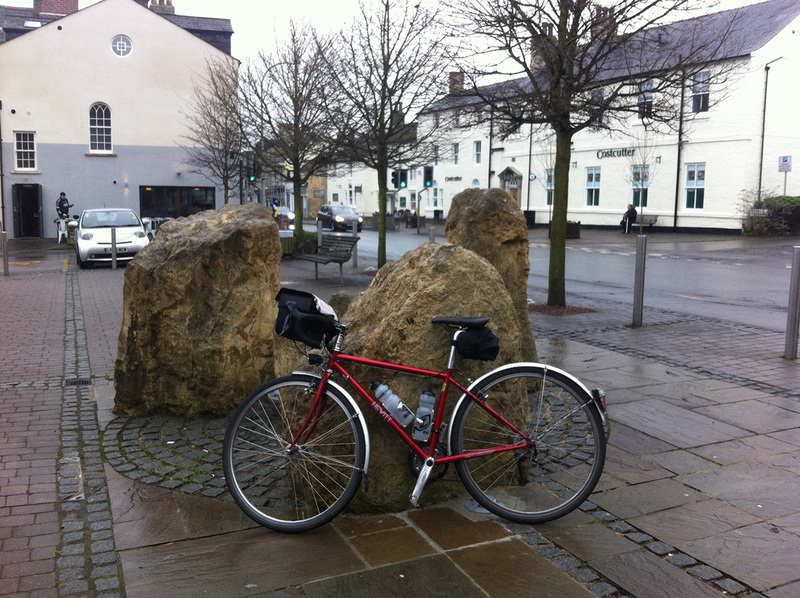 New Border Raid 600 km….Super Randonneur!